There is nothing like a birdie bathed in red wine to usher in the fall season. This. Dish. Is. Spectacular. It’s homey and cozy and complex and redolent of all good things that simply take time — the perfect marriage of meat and mushrooms and herbs and wine. Not only is this dish just delightful to savor, but it makes the house smell wonderful. 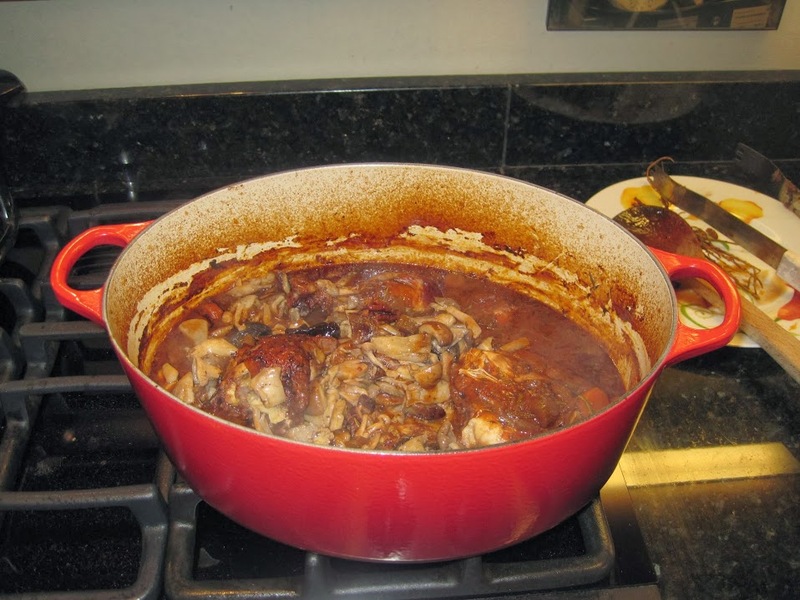 If I was trying to sell my home, I would have a pot of this bubbling away — sell your house AND have a long-simmered classic French dish to enjoy. Bonus! 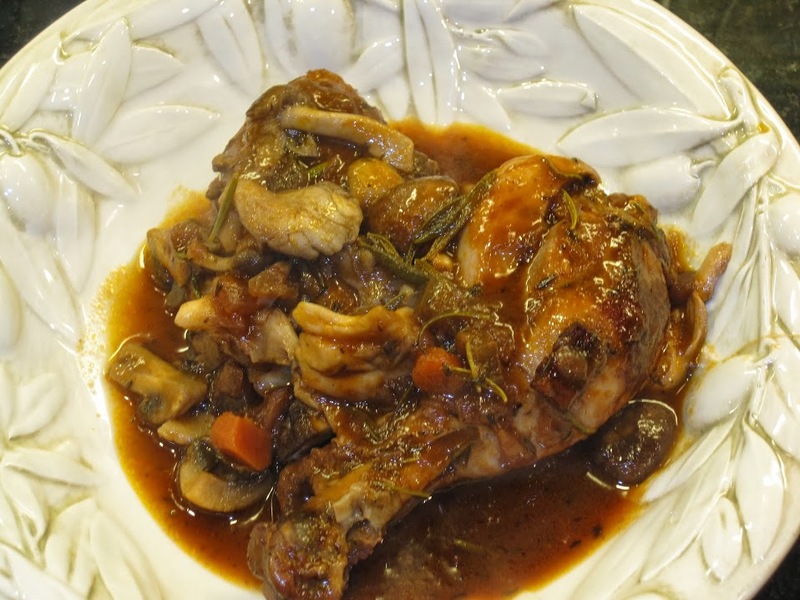 Yes, Coq au Vin does take some time, but it’s well worth it. I followed the recipe almost exactly (yes, it’s important to stand there and brown every piece of chicken), but I did decrease the fat content without skimping on flavor. I poured off the fat after browning all the chicken and also poured off all the bacon fat after rendering. The result was a silky rich sauce without all the oil and grease. So, get yourself a fresh baguette and get to dunking. What are you waiting for? 3 to 4 cups of julienned vegetables: cabbage, carrots, etc. Heat oil in a large skillet. Add garlic and ginger and cook until golden brown. Add pork and continue to cook until well browned. Add soy sauce, vinegar and sesame oil and stir to coat. Dump in veggies and cook until just crisp-tender. Serve with wrappers, hoisin sauce, peanuts and fresh herbs. Roll and eat. It’s Supper Club time again tonight. The theme is Thai and I am bringing shrimp in caramel sauce. Asian cabbage salad: shred cabbage and dress with minced garlic, lime juice, sesame oil and minced Thai red peppers. Fall salad with apples and comte cheese: this is my absolute favorite fall salad. The combination of crisp green apples, nutty comte cheese and crunchy hazelnuts is fantastic. Moo Shu seafood. Yum, I love this dish. It’s a much lighter and healthier version then what you would typically get at a restaurant. Recipe to come.